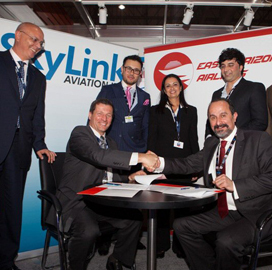 SkyLink Aviation and Afghanistan-based East Horizon Airlines have formed a joint venture to provide aviation and logistics services across that country, the companies said Nov. 19. The announcement noted East Horizon is the youngest airline in Afghanistan and the first to be compliant with the Afghanistan Civil Aviation Authority‘s new rules and regulations. “The Afgan first program is an effort to not lose the gains from America’s longest war by building infrastructure in the country that will facilitate business, ” David Dacquino, SkyLink CEO, told GovCon Wire. Jahed Azimi, CEO of East Horizon, said the airline aims to reach new destinations in Afghanistan through the partnership. East Horizon added that it is also the only airline that flies between remote provinces and the capital of Kabul. “Transportation infrastructure is the most critical initially so business can actually take root, ” Dacquino said. SkyLink has worked with NATO on rotary-wing missions for the past five years there, the companies said Tuesday. SkyLink said it has been providing air transport services in Afghanistan for 10 years, mainly with rotary wing aircraft, while East Horizon provides fixed wing scheduled services within Afghanistan.